As any parent knows, and any parent to be anticipates, life with a newborn comes with significant adjustment. Your entire routine is suddenly turned upside down to adapt to frequent feeds, nappy changes, broken sleep and falling madly in love with your baby. This is yet again my current reality with my second child having recently entered the world, and thankfully being our second child, it has helped us be even more prepared this around for making that first month a whole lot easier, with ways to make your life easier with a newborn. All it takes is a little forward planning. When you are tending to the almost constant needs of a new baby, you haven’t got a lot of time to spend in the kitchen. You could get your partner to take over, providing they have some time off, but even their routine is disrupted so there are some great options to save time while still eating well during those early days. Freezer cooking – Plan out some bulk meals at least 2 weeks before you are due (in case bub decides to come early) and do a bulk cook up session of freezer friendly meals. We often cook up a whole month worth of meals in a single afternoon. This means you simply need to defrost and reheat and away you go. Home delivered meals – By home delivered, I am not talking pizza and other fast food. There are plenty of services available that do healthy meal plans, made fresh and delivered to your door. They usually come weekly and you can choose to have all 3 meals a day, lunch & dinner or just dinners. They can be a little expensive but a great time saver and lots of variety if the thought of freezer cooking doesn’t appeal. Simplify – If you do run short on time, be sure to at least keep meals simple. Recipe bases, one pan dishes, salad wraps, and anything that has minimal prep time is what you need. Also online grocery shopping is a nice sanity saver instead of dragging a tiny new baby to the shops in those early days. If there’s something that desperately needs doing, do it (or get someone else to do it) before the baby comes in regards to big tasks. For the small day-to-day stuff, only do what is necessary. Clean dishes and clothes are pretty essential but don’t sweat it if you suddenly stop vacuuming every week. People get it! Other things take priority. But if it really bothers you, get some help. Partner, mum, sister, friend. Don’t be afraid to ask for help. Most people are happy to feel needed and have a purpose while you adjust in those early weeks, or if you can afford it, hire a cleaner once a week to do those big jobs. There is every chance you may find there is an item you need and hadn’t thought of once the baby comes, which may mean an unexpected, urgent trip to the shops or a bit of unwelcome stress. It can be impossible to cover everything because each baby and mother have different needs and some of these are unexpected. However, do what you can to cover all the essentials before bub comes. Use a new baby checklist to tick things off and as an extra source, ask a friend or family member with recent new baby experience to double check you have what you need. This doesn’t mean going overboard and covering all bases. Most babies don’t need too much initially, but preparing is a huge help. 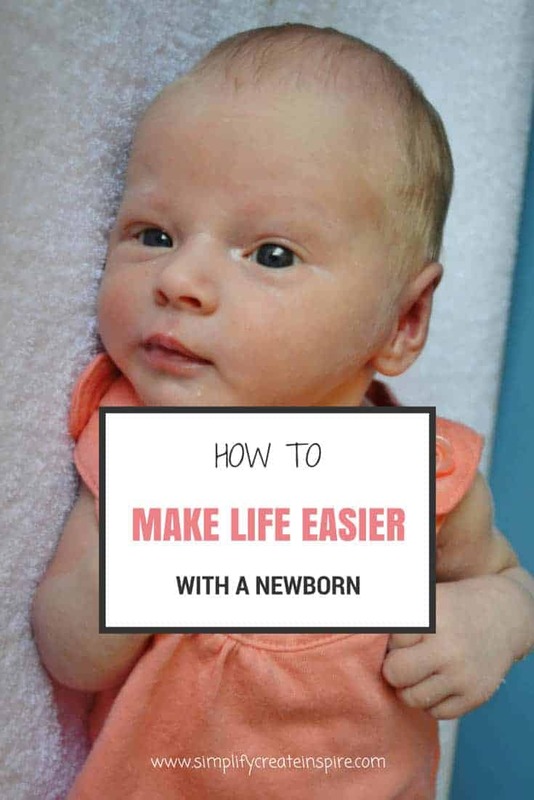 Did you find ways to make life easier with a newborn? Share your tips below. Yes, they are all good tips. The visitor one is tricky for sure but it’s good to know that you can say no. I will definitely be more prepared if we have no 2. Congratulations on your new arrival!